ICANN is a not-for-profit, public benefit corporation dedicated to: preserving the operational security and stability of the Internet; promoting competition; achieving broad representation of global Internet communities; and supporting the development of policies appropriate to its mission through bottom-up, consensus-based processes. The NomCom is charged with populating a portion of the ICANN Board as noted above, as well as the ALAC, the ccNSO Council and the GNSO Council. The NomCom compliments the other means for filling a portion of key ICANN leadership positions achieved within the Supporting Organizations and Advisory Committees. The Bylaws also state that the NomCom shall adopt such operating procedures as it deems necessary, which shall be published on the ICANN website. The NomCom is designed to function independently from the Board, the Supporting Organizations, and Advisory Committees. NomCom members act only on behalf of the interests of the global Internet community and within the scope of the ICANN mission and responsibilities assigned to it by the ICANN Bylaws. Members contribute to the NomCom both their understanding of the broad interests of the Internet as a whole and their knowledge and experience of the concerns and interests of the Internet stakeholders that have appointed them. The challenge for the NomCom is to integrate these perspectives and derive consensus in its selections. 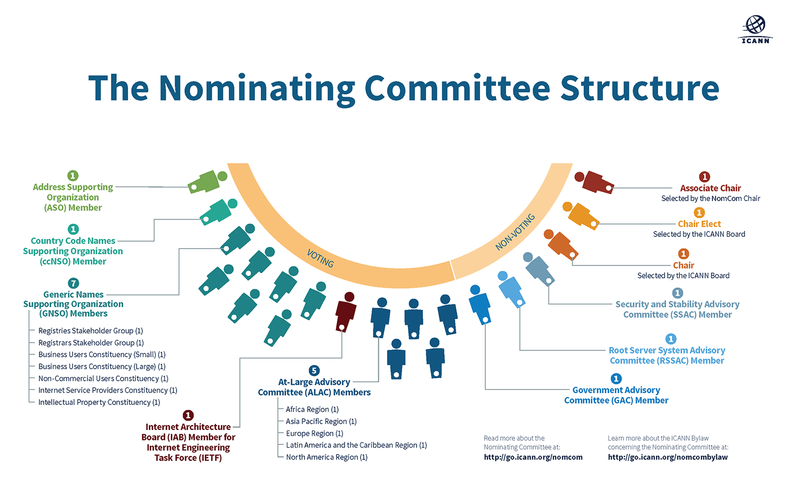 Although appointed by Supporting Organizations and other ICANN bodies, individual NomCom members are not accountable to their appointing constituencies. Members are, of course, accountable for adherence to the Bylaws and for compliance with the rules and procedures established by the NomCom.